Only a few hundred Iberian Lynxes remain in the wild today, compared to thousands only a few decades ago. The Iberian lynx is the world’s most endangered species of cat and can be found in Spain. Spain’s mammal biodiversity faces a high risk of extinction compared to other European countries. 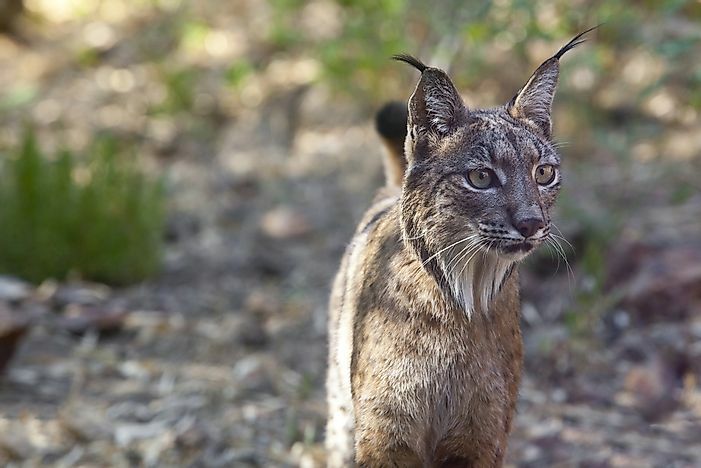 The number of endemic mammals such as the Iberian lynx has reduced dramatically over the years making Spain one of the most important focus points for conservation. Per the Spanish ministry of Food, Agriculture and Environment, there are about 150 animal species that are threatened and endangered. Overall, Spain is among the 25 most important places in the world for biodiversity. Here are the most important mammals in Spain that currently face the danger of extinction. The Iberian lynx (Lynx pardinus) is the world’s most endangered species of cat and could be extinct within a short period. It is a medium-sized species though smaller than the relative, Eurasian lynx. The Iberian lynx is characterized by a spotted coat, bobbed tail, long legs and a strong body. The male species is usually much larger than the female species and both have prominent whiskers and erect tufts of hair on the tips of the ear. The Iberian lynx preys on rabbits as a main diet. Consequently, a sharp drop of the rabbit population poses a real threat to this feline species which has a low ability to adapt. The continuous loss of scrubland due human development has significantly reduced the habitat of the cat. The International Union for the Conservation of Nature has decreed the Iberian lynx as a critically endangered species which could be the first cat to become extinct in over 2000 years. The Mediterranean Monk seal (Monachus monachus) belongs to the pinniped (fin foot) species and is one of the two remaining earless Monk seals. The Caribbean species (Monachus tropicalis) is already extinct, while the Hawaiian species (Monachus schauinslandi) is critically endangered. Today, there are only about 700 individuals of the Mediterranean monk seal. The Mediterranean monk seal has reduced in number due to commercial seal hunting and human persecution. Additionally, habitat loss and deterioration, persecution and displacement have resulted in fragmentation of the species into subpopulations that face even higher threats such as disease, and toxic algal blooms. The brown bear (Ursus arctos) is one of the largest living carnivores in the world. Depending on the location of the brown bear, the color can vary from dark brown, cream and even black. It is mainly found in mountain woodlands in Europe and on the fringes of deserts, ice fields, and mountain forests. The brown bear faces serious threats because of hunting and big game trophies. They are poached for their meat and skin which is sold at very high prices in Asian aphrodisiac markets. Habitat destruction and persecution by humans also contributes to the endangerment of the brown bear. Human/bear conflicts are common in many places around the world since bears can interfere with livestock, water sources, and orchards. The European Mink (Mustela lutreola) is a medium-sized mustelid with a long, slender, arched body, having short legs and a short bushy tail. It is one of Europe’s most endangered mammals. It has a blackish-brown fur with a distinctive white color around the lips and sometimes on the throat. It is native to Spain, France, Romania, Russia and Ukraine. It is classified as Critically Endangered on the IUCN red list. Other threatened mammals in Spain include the Italian wolf, Mouflon, Barbary Sheep, Bechstein's Bat, and Broom Hare.